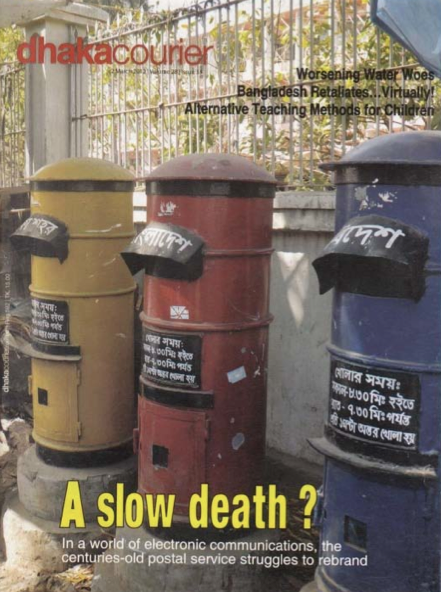 The red, green and blue mail boxes stand like tombstones in front of the post offices in Dhaka and even before the Dhaka GPO. But Adnan Firoze discovers there is life in the venerable institution yet. Hasibul Hasan, a masters student of the Department of Microbiology at Dhaka University sent some academic transcripts to a US university via the Bangladesh post office last year. By the time the documents reached their destination, however, the deadlines were up. Today, we have a superfluity of mailing services, be it snail mail or electronic mail. We have the internet facilitating video mail, voice mail, email and so on, all stomping the old monopoly of the Bangladesh Post Office, the “allegedly” primitive postal mail. One may choose to callously call it snail mail but there was a time, when it was the only choice and it serviced the nation with pride. We find the expansive image of Tarashankar Bandhopadhyay’s Dak Harkara or “the runner” in poetry, short stories and fables in Bangla literature. However, are the modern Harkara dead? When was the last time you had written a letter using a pen and paper? If you cannot remember, you are among the 90% of the Dhaka dwellers who have moved on to the generation of e-mails and social networking. With the advent of the internet and courier services, the postal system of Bangladesh has gone to the sidelines. But some burning questions are: is the postal system still alive? The ministry and the post offices along with the GPO are alive and well; so what exactly are they offering? Are the people informed about their existence? Can the regular folk connect with the postal system once again? These concerns should not only be ours but also the government’s. Amjad Hossain, 65, is a postman at the Banani post office. He has served the postal service for 32 years. Amjad looks back at his busy times in the 80’s when he said “I remember delivering legions of letters to households. There were people whose faces brightened up at my sight.” He contemplates in a melancholic tone, “Today I have grown older but so has the post office. People’s faces do not brighten up at the sight of us today, since most of us carry bills instead of letters to them. To make things worse, I have to make most of the deliveries to the guards instead of the families, now that there are apartments everywhere. We are no longer the family friend but the friend of the security guards. However, I am happy – the post office has provided me with a bicycle last year so I do not have to walk as much at this age.” Amjad Hossain is the face of Bangladesh Post Office, a khaki clad pedestrian who roamed the streets delivering letters and emotions to the people for decades with pride. But that day seems to have passed. 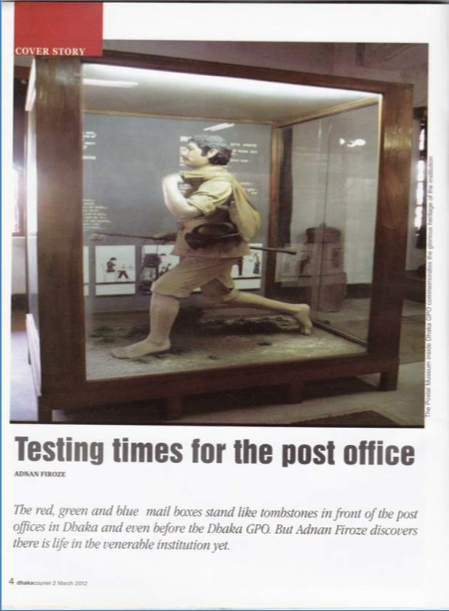 The Bangladesh Post Office has a history of great prestige and heritage. The history of the post office is intertwined with that of the postage stamps that commemorate most of the chronology of the history of this land. Archaic literature gives evidence of postal systems of the land demarcating Bangladesh. The Vedic work Atharvaveda records the existence of the earliest postal system in the subcontinent, but whether it was in vogue in Bengal is not known. Literary sources and folk tales, as well as rhymes, reveal that the duts or qasids (messengers) and pigeons were used to send messages. Ibn Batuta, travelling during the reign of Mohammed bin Tughlaq (1325-1351) recalled that there existed two different kinds of postal system: mounted couriers travelling on horses, and the general couriers on foot. He commended the postal system of Bengal immensely. During the period of Warren Hastings of East India Company, a General Post Office (GPO) was established in Calcutta on 17 March 1774. In 1784, the “Palki Dak” (palanquin postal service) was introduced. The palki dak would carry both passengers and letters. The “Banghy Dak” or the parcel post was introduced through various dak chowkis of eastern Bengal in 1785. Dynamism was always an attribute of the system. Embossed envelopes valued at 1 anna (penny) were introduced on 1 July 1873. Dispatching letters by registered post was introduced on 1 August 1877 and insured letter service in 1878. Letterboxes were first inaugurated in 1856-57. The money order system was introduced in all post offices from 1880. Express telegram service was introduced in 1909. Thus, all the groundwork for a full fledged postal system was equipped over a century ago. Moving on to the times of the birth of the nation, the Mujibnagar government of Bangladesh set up a postal service on 17 April 1971 in Kushtia with more than 50 field post offices in different fronts or border areas, administered by the Mukti Bahini. It released 8 definitive stamps, which were the first stamps of Bangladesh, on 29 July 1971 simultaneously from Mujibnagar secretariat, the Bangladesh diplomatic missions and the House of Commons in London. As many as 120 post office buildings were burnt and about 200 officials were killed in the war. After the war the whole postal system had to be reorganised. The total number of post offices in 1971-72 was 6,667 with a staff of 24,983. Later, Bangladesh became a member of the Universal Postal Union (UPU) on 28 February 1973. It was obvious that the system never halted to a state of stagnancy. To provide training to officers and staff, a Postal Academy was established in Rajshahi in 1986. At present, the number of post offices in Bangladesh is a little above 10,000 and they cover a total route of 47,410 km. There is one post office for every 15,827 citizens. With such a diversely rich and dynamic history backing it up, the question poses itself: is the postal system at a decline? If so, how can it be saved? A more pragmatic question is, is it worth saving in the internet age after all? A popular trail of the BPO is “Postal Life Insurance” which was started over 100 years ago as a scheme for the benefit of Postal employees. Today the scheme is not only open to government and semi-Government employees but to all person having assured means of regular income. From the reports of BPO (Bangladesh Post Office), the status of the current postal system is not as bleak as it seems to be. You may not send letters anymore, but that has not stopped the postal system from developing itself to stand the trials of time. After a prolonged delay of 111 years, The Post Office Act, 1898 was amended and passed as The Post Office (Amendment) Act, 2009. This has enabled the postal department to render new value added services to the customers through product diversification, to facilitate the catering of their changing needs. A project has been formulated by Bangladesh Post Office for establishing Post e-centres at each of the 8500 rural post offices of the country. This project aims at bridging the digital divide between the rural and urban people of the country by enabling them to have access to modern ICT based technologies. Electronic Money Transfer Service (EMTS) was inaugurated by Prime Minister Sheikh Hasina on March 26, 2010. This service was commercially launched in a limited scope (in 104 post offices) on May 01, 2010. However, in response of overwhelming demand, this service has now been expanded to 2223 post offices throughout the country including all district Head Post Offices and Upazila Post Offices. Bangladesh Post Office is now implementing a project named “Process Automaton of Postal Department”. This project primarily aims at automating the activities of 134 offices including 71 Head Post Offices and 13 Main and Sorting Offices through computer hardware and an integrated web based application software. The government has made partnership with privately owned corporation – Synesis IT to implement this particular project. However, this is ongoing. Postal Cash Card that had already been inaugurated by the Prime Minister in 2011 is now in operation in 439 post offices. This service is supposed to be gradually expanded to the post offices throughout the country with commercial importance. This card minimizes the risk of carrying cash and enables customers to reap the benefit of encashment in post office counters and ATM booths. This card also acts equally as a Debit Card and Plastic Money. However, if no one is aware and no one is using these, then all the services will be rendered useless. Also, the observation is that the post office is bringing more innovations to the “monetary” services as opposed to the traditional act of transportation of messages, letters and items is indeed rather alarming. Another concern is the fact that some of the innovations that are functional, are only limited to some of the post offices. Thus, the expansion of the technologies is rather limited. “Digital Post Office” – but when? Even though the Prime Minister has argued “each of 8500 rural post offices of the country will be converted into Post E-Center”, going to the local post offices begs the question as to when will that promise see its embodiment? The Postal Savings Bank, a financial wing of the BPO, is facing problems in expanding services to the grassroots level, despite the high demand for savings schemes, because of shortage of funds and manpower – claimed the authorities. Only 1,550 of more than 10,000 post offices in the country have the financial facility. However, Mr. Zakir Hasan Nur, Deputy Postmaster General of Dhaka GPO argued in his exclusive interview with Dhaka Courier that “the PCC (Postal Cash Card) which is the postal service’s debit card, is being outstandingly received by the people.” He further maintained that “the service is affordable for Dhaka dwellers as well as the people at the grassroots level since the minimum deposit to be maintained is only 10 taka.” “The coverage of this service has reached the Zila and Upazila levels already and it is expanding further down the hierarchy of the postal system” he assured. He further mentioned that a deal has been signed with Q-Cash and by the end of 2012, all PCC holders will be able to transact through any Q-Cash ATM booth. Moreover, Mr. Nur exhibited his satisfaction over the fact that POS (Point of Sale) machines have made its way to almost all the post offices in the country. This device is a small handheld device to facilitate everything that an ATM machine does except for the dispersion of cash, which the postal service does manually. This is indeed an impressive progress in the days of decline of the avenue. Therefore, the digitisation of the postal system is going at full throttle. But the question remains: how many of the general masses are informed about these services the postal office is offering? Even if the postal system evolves into a sophisticated electronic venture, if people are not aware of the services then the money put into the undertaking will go in vain. Being asked about this specific issue, the Deputy Postmaster General gleefully announced that the day of the interview (27 Feb, 2012) is when BPO had taken their first step in the promotion of the Postal Cash Card through a newspaper ad. He exclaimed “After the PCC ad got out in the morning, the phones are keeping on ringing about queries regarding availing the service at such low cost. We have received more than 500 calls before afternoon.” He then waved our sight to the extremely busy customer service operators who were incredibly occupied explaining their new service to the customers. With all the impressive and innovative services, the doubt about postal security remains. The Postmaster General argued that “all mails and parcels go through three checkers at the very end of reception. If the majority of them are corrupt (or not present), that is when the security becomes fragile.” Upon asking the reasons for this, he maintained that “the postal service is still understaffed and goes without adequate funds. Moreover, the better gazetted officers do not see this prestigious service as a lucrative career, for which we do not get the best of employees often.” Young postmaster Khondokar Shahnur Sabbir of Khulna reaffirmed this statement. As for private courier services, the modern globalized citizen cannot be held accountable for taking better service by paying more. The Deputy Postmaster General argued that “We, the BPO are the regulators of the private courier services but as long as they are abiding the rules and providing good service, we cannot police their businesses just to increase our own.” However, he assured that “the current postal system, at least the Class-A post offices are fully equipped to handle fragile and emergency deliveries; it is only for the people to decide if they can regain their faith on us.” “Give us another try” he asserted. Thus, the BPO will not illegitimately combat the private courier services; instead their view to the notion is very pragmatic. Only when (and they argue that the time has come), the masses will feel secure about the BPO, they will return to the post offices. For Shayantani Arpa (29), a housewife living in Mohammadpur, the reliance on letters is still intact. She argues that the “personal touch” that is present in the handwritten letters can never be replaced by technology. According to her, she has lost letters in the past and some letters did not get delivered but most of them did. She is not sceptical about the system even though it has turned out to be a joke for many of her contemporaries. We have already seen the disparities of opinions regarding the postal system from Masters student Hasan to whom the postal system is a sham, but to Nahar the entrepreneur, the system is a necessity. These contrastive perspectives are what we see as the digital divide which the postal system has failed to bridge before the recent developments. The Post Office is definitely worth saving because, only a fraction of the population are metropolitan dwellers while the rest still rely on the postal system – be it for letters or monetary transactions. With the new e-services the postal system has introduced, it may be practical to hope that it will bridge this gap indeed. Thus, it is not a lost cause after all. Even the post offices in Dhaka city are booming with crowd. People are amassing in front of the Postal Cash Card counters at the GPO. The post office is bringing in new innovations but what they primarily lack is promotion and security. If the proposed and implemented services such as PCC, EMTS, Mobile Wallet and other modern systems see the light of day and receive mass expansion across the country, then the postal system is bound to bridge the digital divide and revive itself to be presentable and reliable to the masses from all economic paradigms.